Wisconsin voter ID law: Republicans want to end weekend voting. 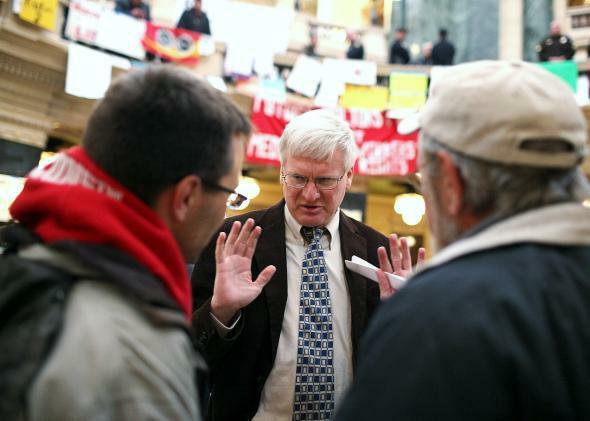 Wisconsin state Sen. Glenn Grothman thinks it’s easy enough to vote already. I’ll be your humble Weigelblogger for the next few weeks while Dave is on book leave. Please bear with me. If there were an annual award for Zaniest State Legislator of the Year, Glenn Grothman probably wouldn’t win, but he’d come close. The Wisconsin state senator represents the wealthy exurbs north of Milwaukee in Washington County, and handily won re-election last year with 69 percent of the vote despite a failed recall attempt. Aside from being one of the primary union-bashing lawmakers in the state’s collective bargaining debacle back in 2011, Grothman has spoken out against Martin Luther King Jr. Day and denounced Kwanzaa as a liberal scam. “Of course, almost no black people today care about Kwanzaa - just white left-wingers who try to shove this down black people’s throats in an effort to divide Americans,” he wrote in a press release. Wisconsin Republicans are pushing a bill to end early voting on the weekend. The measure would make it harder for people in the state’s most populous areas to cast a ballot—and it would hit blacks especially hard. But state Sen. Glenn Grothman, a Republican who is sponsoring a Senate version of the bill, told msnbc it’s already easy enough to vote. Wisconsin’s voter ID law has been called the most restrictive in the country, though the law in Texas and the law in Kansas (which requires proof of citizenship) are close runners-up. A challenge to Wisconsin’s voter ID law in federal court* concluded last week, but the ruling likely won’t come until early next year. Correction, November 19, 2013: This post originally said Wisconsin’s voter ID law was being challenged at the state supreme court.